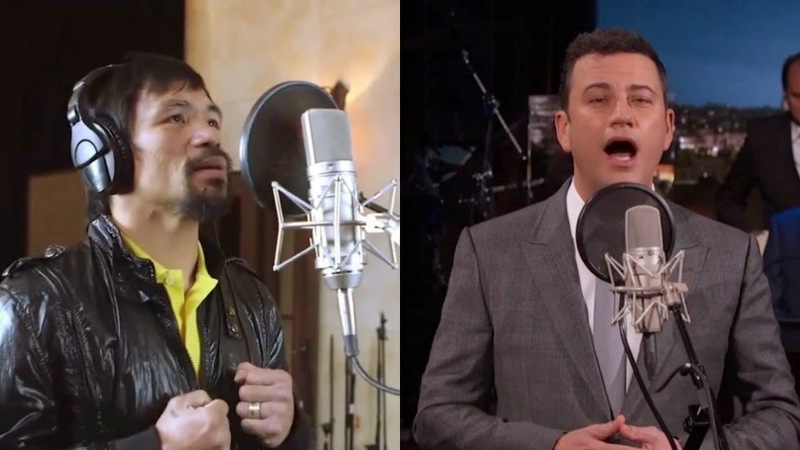 This was Jimmy Kimmel, host of the popular Jimmy Kimmel Live on abc said after featuring Filipino pride Manny Pacquiao's latest song “Lalaban Ako Para Sa Filipino (I Will Fight for the Filipino) on his late night talk show. To the delight of the audience, Kimmel sang parts of it in his program at least three times. After singing a few lines, he said: 'That translated into England means "I'm gonna beat Floyd Mayweather's face in." Pacquiao thanked Kimmel for his support to the Pinoy boxing icon that is set to fight with Floyd Mayweather Jr. on May 2 (May 3 Philippine Time). Pacquiao recorded the song and even made a music video, which is expected to be used for his ring entrance for the fight. The boxer has been a frequent visitor of the late night show and has even joined some skits. The eight-division champion also previously sang a duet of John Lennon’s classic, “Imagine,” with comedian Will Ferrell on the show. Come May 3 at 4am in KSA and 5am in UAE (May 2, 9pm EST/6pm Pacific), ABS-CBN TFC is exclusively distributing what is billed as the “Fight of the Century” between Pacquiao and Mayweather to boxing aficionados in the Middle East. Fans in the region can catch the mega-fight between two of the world’s best pound-for-pound boxers LIVE from the MGM Grand Garden Arena in Las Vegas via PPV on the following cable networks: OSN, eLifeTV and Du. Why be judged for what you feel? What will it take for us to be heard? Do we have to be born with privilege?